Some of the earliest uses for horse hair fall back to the 18th century. Horse hair was used for upholstery and shaving brushes. One of its first debuts in fashion was in military attire. A dragoon helmet was an ornate style of metal combat headgear featuring a large crest and often showcasing a long horse tassel mane. They were initially used by dragoons, but later by other types of heavy cavalry and some other military units. Dragoons were considered a class of soldiers mounted on horseback, but dismounted to fight on foot. Originating in France, in the second half of the 18th century, it was widely imitated by other European armies and was last used in combat in 1914. Helmets with pony tails where all the rage! 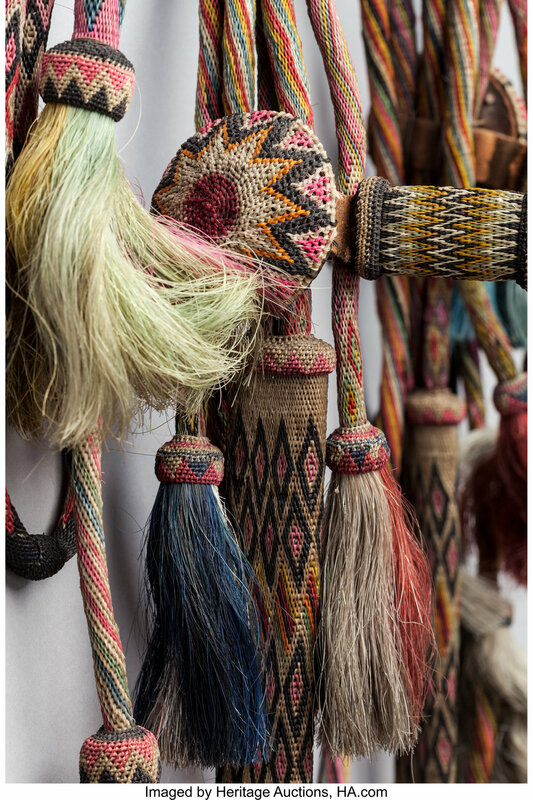 Further West, around the 1800s, a horse hair knotting technique called “hitching” was used in making horse bridles. It was a calming activity to prison inmates. Horse Hair "Hitching" was a common activity for prison inmates. These fibers are generally made up of proteins and consist of hairs or wools from animal. Hair taken from the mane is softest and ranges from 50 to 150 microns (a micron is about 0.00004 inch) in diameter. As a Designer, I like how fine the density is of each strand. Because my new designs come from the horse’s tail, the strands are strong and straight. Some articles and experts describe the hair from this region as coarse and not as nice as the mane. But I like this feature, the texture allows my tassels to stay straight as well being available to dye! IS IT HARMFUL TO RETRIEVE HORSE HAIR? So this could be controversial, as I am not a horse expert. Through research, the final consensus is that it is that it should be done by a professional and should not be cut too short . Horses primarily use their manes to swat away flies. It takes about 6-9 months for the tail grow back depending on the length of the cut. I purchase my bundles in 15 inch increments which can be cut down to make small tassels maximizing the usage. Thanks for reading! Enjoy your horse hair Jewelry!! My first journal entry!!! Finally a little downtime in between shows, designing and creating! Cartameb II is my voice merging my career in Fashion and studies in Landscape Architecture through design and fluid form. I'm all about texture and softscape, while being kind to our environment. I am fascinated with flexibility of fibers and the impact it has on our environment. Natural fibers allow me to make my own changes that tailor to Cartameb II’s style. Natural fibers are defined as substances produced by plants and animals that can be spun into filament, thread or rope and further be woven, knitted, matted or bound. See all that versatility! I mean, you need that umbrella to stay dry! Don’t you?! And Thank goodness your work-out clothes stretch, mold to your body while keeping you cool! No matter how hard you sweat it out! Synthetic fibers have their benefits. But the benefits for using Natural Fibers out way the uses of Synthetic, especially in their disposal stage. They can break down like compost and improve soil structure by decaying through the action of fungi and bacteria.. High five to NO Toxic Pollutants! How to know you’re using natural fibers. So YES FRIENDS the test does include FIRE. By burning a small portion of the fabric (trim, cord etc), you can see if the fabric is 100% natural or include synthetic fibers based on their reaction to the fire. Natural Fibers burn crispy and crumble to ashes. Synthetic Fibers melt with no ashes. But as you can see the synthetic fibers melt like hot plastic! Which is also useless for my natural dyes! Super safe for you use the Burn Test at home to prepare for your DIY projects. Do not allow the flame to last longer than a few seconds. Especially with natural fibers. They tend to blaze rather quickly! Thanks so much for reading my first journal post. Till the next time! Learn about our inspirations and design process.